Warren unveiled a plan to guarantee child care for every child in the U.S.
2020 presidential candidate, Sen. Elizabeth Warren, a mother who knows the struggle of affordable child care from her own experience, unveiled a plan on Tuesday to guarantee child care and early learning programs to every child in the U.S. for free or for far less. "It will be free for millions of American families, and affordable for everyone," Warren wrote in a 1,700-word description of the plan published in a post on Medium Tuesday. Warren, a two-term senator from Massachusetts, is one of nearly a dozen Democrats running to challenge President Donald Trump in 2020. The initiative, dubbed the Universal Child Care and Early Learning plan, would provide options for formal care and early education to every kid in the country, beginning at birth and continuing until school age, according to the plan. Families, based on certain income levels, would qualify for free care, while those who didn't would see prices capped at 7 percent of their annual income, Warren wrote. An independent analysis found that around 8 million kids would have access to the programs for free, according to Moody's Analytics. The benefits of early child care have long been documented, even showing taxpayers can make money back when investing in high-quality early education. "My plan gives every kid a fair shot," Warren wrote. "In the wealthiest country on the planet, access to affordable and high-quality child care and early education should be a right, not a privilege reserved for the rich." Warren's plan intends to partner already-existing child care providers with resources provided by the federal government, which would "pick up a huge chunk of the cost of operating these new high-quality options," according to the plan. The government would hold providers to new "high national standards" and child care providers would get a pay bump through the federal subsidy that would reflect what's expected of the guidelines -- which Warren described as comparable to the work and pay of public school teachers. Any family making two times the federal poverty level, which varies depending on family size, would qualify for free child care. That would include, for example, any family of four making less than $50,200 a year, or any single parents making less than $32,920 a year. 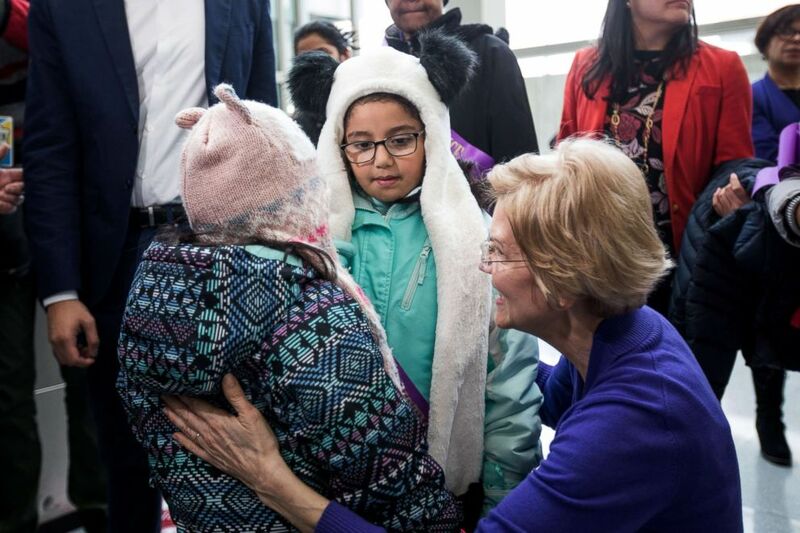 (Scott Eisen/Getty Images, FILE) Sen. Elizabeth Warren greets two children after a rally for airport workers affected by the government shutdown at Boston Logan International Airport, Jan. 21, 2019, in Boston. If a family made more than 200 percent of the federal poverty line, they would be charged no more than 7 percent of their total income. "My plan provides the kind of big, structural change we need transform child care from a privilege for the wealthy to a right for every child in America," Warren wrote. Warren plans to pay for the child care initiative with another plan she's campaigning on: her Ultra-Millionaire Tax, which would tax families who have a net worth of more than $50 million. The Ultra-Millionaire Tax would generate about four times more than what would be needed to pay for the Universal Child Care and Early Learning plan, according to Warren. Warren's campaign estimated 12 million children would be able to take advantage of the new program. "My Universal Child Care and Early Learning program is a win-win-win: it’s great for parents, for kids, and for the economy," Warren wrote Tuesday. Warren's plan is of personal interest. She raised her two children while navigating her early career as a lawyer and law school professor. She had her daughter while attending law school at Rutgers University in New Jersey, often taking her to campus with her, and it wasn't long after she had her second child -- and divorced her husband, taking on the challenge of single motherhood -- that she was teaching law at the University of Houston. She often speaks of the difficulties of affording care -- and the quality of care she wanted for her kids -- while working. In unveiling her plan, she described an incident in Houston, when she picked her son up from day care and found he had "been left in a dirty diaper for who knows how long." "I was upset with the daycare but, more than anything, angry with myself for failing my baby," Warren wrote Tuesday. Warren credits an elderly aunt from Oklahoma, who moved in with her soon after she moved to Texas, as the only reason she was able to take care of her children while holding onto her job.